Private Bass Guitar tutoring lessons Franklin, MA. Check out some of our most popular teachers near Franklin, MA including Boston, Cambridge, Brookline, Somerville and Lexington. Bass is thought of as easier than guitar, but if you believe that you're just not playing the instrument right. The bass is arguably the most important instrument in any kind of music (Jack White doesn't agree with me on this) Every chord has a bunch of matching scales and lines and riffs that every serious bass player should know front to back to be able to carry a good band. All levels welcome. I am a 32-year old Massachusetts native and have been playing music since I was 8 years old, starting on the piano with a wonderful teacher in Beverly who also went to Berklee. I picked up the guitar and the bass in high school and got into rock, jazz and blues and haven't looked back. I received a bachelors degree from Berklee in 2012 with a major in Professional Music and minor in Music Education. Music study is great exercise for your brain. It works both the left and right hemispheres of the brain simultaneously because you are thinking both creatively and logically/mathematically at the same time. I am happy teaching students at any level, even if you have never picked up an instrument before. I can work with you and get you on the path to being the kind of musician you want to be. r my lessons to meet a students individual needs. I am a serious teacher, but I am a laid back person. I am easy going, but I will make sure you learn what you need to learn. I can guarantee after 4 or 5 lessons with me, you will have tripled your knowledge of chords, scales, technique, and song repertoire. I am very patient and am happy to work with students of all ages and skill levels. I encourage mid to upper level students to bring in songs they want to learn (if they are at the right level) and I will transcribe them on the spot and go through them with you step by step. If you want to learn how to play all your favorite songs, I am the teacher for you. I won't make you play music you aren't really interested in, but I will make recommendations for songs to improve your playing and include music theory so that you understand what you are playing and why you are playing it. The point of playing music is to HAVE FUN, after all. Fender Blues Jr. III guitar amp, Vintage Gallien Kreuger guitar amp, Carvin/Peavey Bass amp, Epiphone 1 x 12 guitar amp, custom thin line telecaster, custom solid body telecaster, vintage synsonic electric guitar, breedlove acoustic guitar, Tacoma acoustic bass, Schecter stiletto 5 string electric bass, Ibanez soundgear 5 string bass, custom stratocaster, vintage synsonic single coil guitar, 5 string banjo, , Diamond Head tenor ukulele, u-king soprano banjolele , M-Audio oxygen 8 midi controller, Blue Mic USB microphone, Eurorack mixer, shure microphone, 2011 Macbook pro w/ Sibelius, Pro Tools, Garage Band, Reason. Full lutherie shop equipped to do custom builds, guitar set-ups, mods. Picked and fingerstyle acoustic or electric guitar, Fingerstyle or picked bass guitar, ukulele, improvisation, Jazz, Blues, Rock, Hip-Hop, Bossa, recording, lutherie, etc. Dave was great. My daughter appreciated his style and ability to communicate. David was very well prepared, very patient. He has a creative mind and is passionate about teaching. David is a wonderful teacher moving at a strong pace to get as much done in a short time as possible. He comes to the lessons very prepared with lots of great material to help the student learn and improve. Very knowledgeable and wonderful to work with. I highly recommend David as a teacher. Also called Electric Bass puts down the foundation in the band or orchestra. 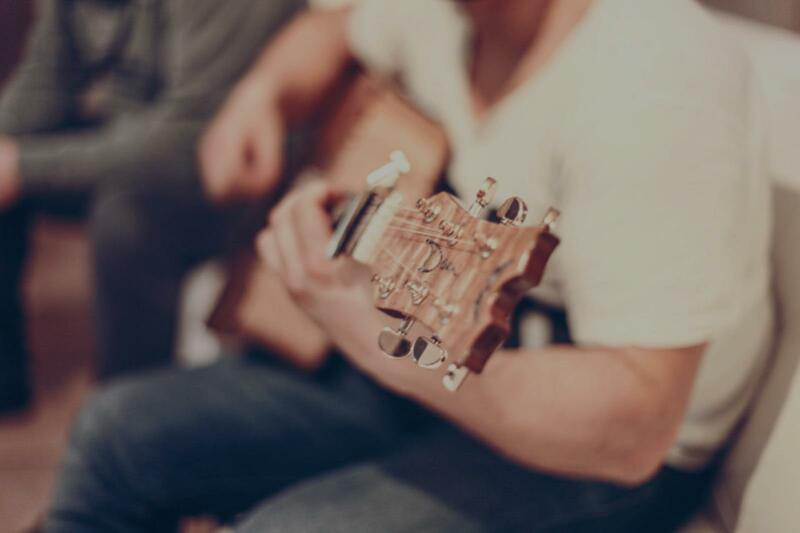 Besides learning notes, chords, finger exercise and theory the student will also learn how to play with a pick or their fingers and incorporate plucking, slapping, popping, and strumming techniques. I focus on playing bass like a bass player and not as a guitar player that plays bass just because he can't find anybody else to do it in the band. I teach mainly using examples and talk a lot about how a bass fits in with other players. Experienced in finger and picking style, song structure, ear training, and many other aspects. I like to cater my lessons to what the student wants to learn. Spend the time learning your favorite bass licks, studying sight reading, learning the fundamentals of groove, dive into jazz theory, or learning about the mental approach to the role of a bass player. The choice is yours! Bass is the foundational element of music. It's an instrument that usually plays a supportive role while maintaining the integrity of the groove, and the feel of the overall sound. My experience as a bassist has been performing with a wide variety of ensembles from soul and funk to folk and rock. This is an instrument I have a passion for teaching because of it's link between the rhythmic and harmonic elements of music. I have been playing and performing for over 30 years. I mainly play Bass, but I can also play Guitar and some Keys. I have played in many bands over the years and I'm currently playing in 4 bands now. I also occasionally do fill-ins. I have worked in recording studios in the past when playing with original bands and artists, and have a small home studio that I currently use for recording music when inspiration hits me. I'm very flexible about how you may want to set up the lessons. Once I understand what you're looking to achieve, we can build a course of study that fits your schedule and goals. Let's chat and get you started playing music! I have been playing and performing for over 30 years. I mainly play Bass, but I can also play Guitar and some Keys. I have played in many bands over the years and I'm currently playing in 4 bands now around the Boston Metrowest area. I also occasionally do fill-ins. I have worked in recording studios in the past when playing with original bands and artists, and have a small home studio that I currently use for recording music when inspiration hits me. hands-on lessons. I really enjoyed doing it and so I wanted to offer lessons to others who might also be interested. Awesome Bass player. Taught me a lot and helped me improve my playing. Great teacher and player. Knows tons of songs and can show you how to play them. Was very easy to learn from him all things music. Starting from knowing nothing about playing Mike has taught me how to play my first songs. I'm even learning how to write my own songs. Very knowledgable in all things music. Perhaps you’re new to the bass. Or maybe you have been at it a long time. Regardless, I’ll get to the bottom of what it takes to be a groove machine. And we’ll have a lot of fun getting there. Can't find a teacher in Franklin, MA? "Awesome Bass player. Taught me a lot and helped me improve my playing." Boston, MA teacher: Michael P.
"Great knowledge of the Bass, guitar, and music in general. Patient teacher and easy going." ible...in addition Dave was patient and changed his approach a couple of times to help my son become more interested in bass going forward! Thanks Dave!" recommend Dave to anyone looking to begin/improve as a musician." "Great teacher and player. Knows tons of songs and can show you how to play them. Was very easy to learn from him all things music." "Great instructor with the knowledge to teach superbly, with the insight to reach high levels of efficiency!" Boston, MA teacher: Scott M.